Its hard to believe that another month has come and gone! Where is 2014 going? I need it to slow down and not fly by so fast! With how busy everything has been lately, I’m a couple of days late in reflecting on last month’s goals and setting goals for the coming month. Better late than never though! I ran one race in May – the BA5k on Mother’s Day. Without any major races this past month, my intent was to focus on using May to make improvements in my running speed and endurance, my weight training, and to use yoga as a way to help me relax more. 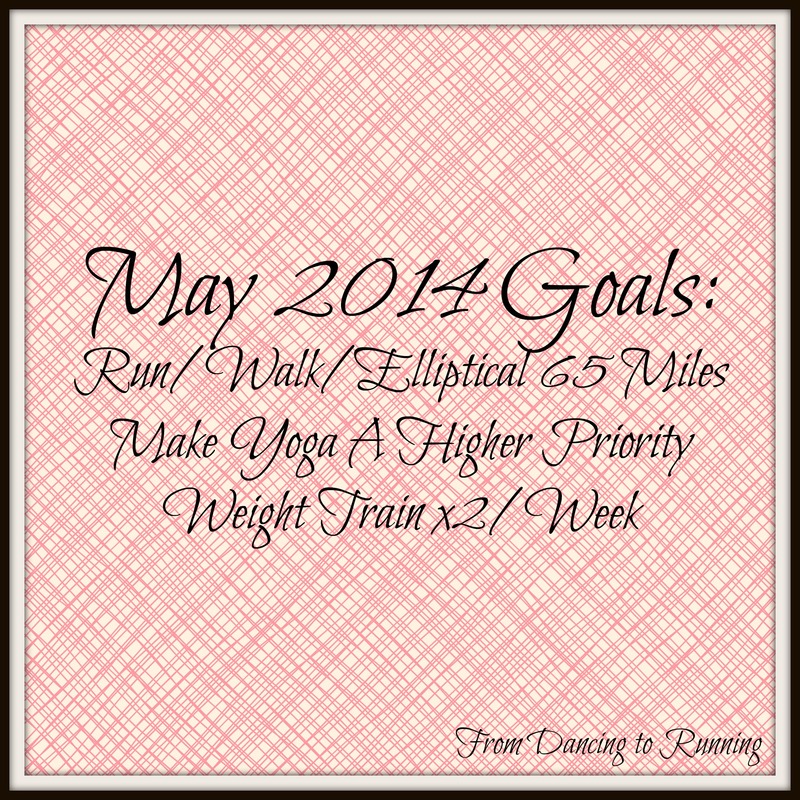 During the month of May, I was on a bit of a roller coaster in regards to making progress meeting my monthly goals. My May goals were very similar to my April goals, as my overall priority was to make progress on the areas that I had been focusing on. For the first half of the month I did very well focusing on all three of my goals (mileage, yoga, and weight training), but by the end of the month I started to find it extremely difficult to find time for everything on my plate. Unfortunately, my training was the main thing that I let slide. 1. Run, walk, and elliptical a total of 65 miles. I completed 52.4 miles in May, which was 80% of my mileage goal for the month. I was on target to complete all 65 miles until about a week and a half ago, when our schedule got extremely busy with house buying related activities, and then of course we were out of town for the last four days of the month, during which I only ran a 5k. 2. Make yoga a higher priority. Practicing yoga was almost nonexistent this past month. I definitely need to work more on this. 3. Weight train at least twice a week. Other than this past week, I was on track in meeting my weight training goal for the month. Of my three monthly goals, I was most successful in meeting this goal. I’m trying to not beat myself up too much for not meeting my goals this past month. Life has gotten extremely busy, and training is only a part of my life. 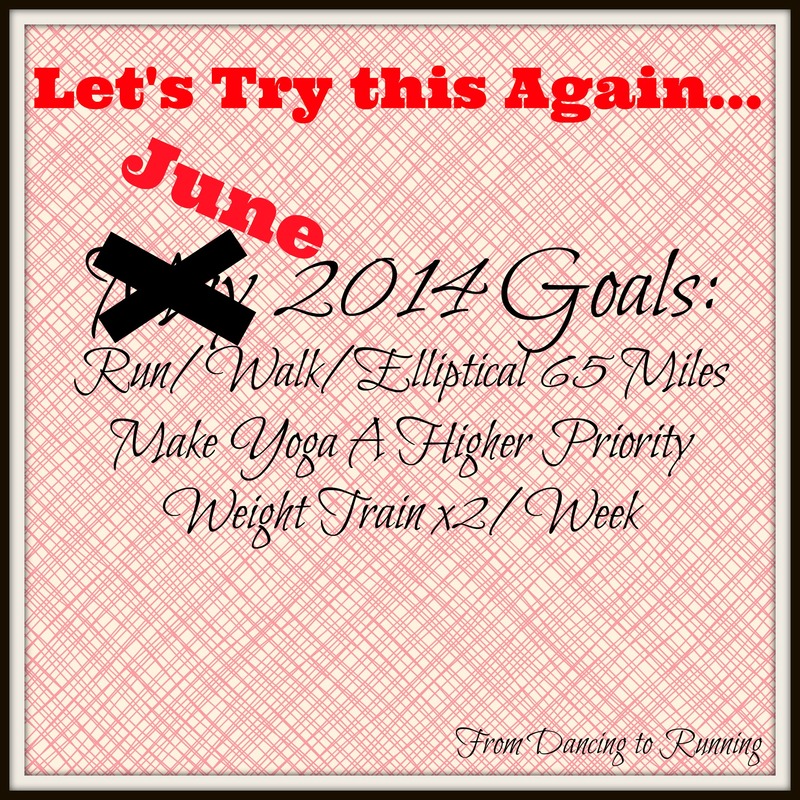 Because of the roller coaster that May was, I want to give these same goals another try during the month of June. With my school responsibilities for the year starting to die down, I’m hopeful that I’ll be able to make greater progress in not only meeting these goals but also making improvements to my overall health and lifestyle. QOTD: Do you ever revisit goals in order to seek improvement? Don’t beat yourself up. Life throws us things when we are least expecting it. I love that you are revisiting your goals. Keep it up! I think it’s realistic you have to revisit goals. Everything is not always to be done correctly this first time around. I’m revisiting a few of the same goals from my previous round of training for my new round coming up. As long as we keep improving that’s all that matters! Progress and practice eventually makes perfect! Everyone has moments where they don’t reach certain goals they have for themselves. Stuff happens. I am proud of you for revisiting your goals and trying again! I have no doubt you will do great in June! Thanks for the support, Kristina. A wise friend gave me a great reply when I was disappointed that I did not accomplish my May goals. She said, “don’t change the goal, change the timing!” It was a good reminder to me to keep pressing on! Hope your June is less crazy and you are able to CRUSH your goals!! Great insight and way to think about it! Thanks for sharing! Revisiting goals is a great thing to do. Sometimes life gets in the way, and things don’t work out in our minds time frame. You’ll get those goals in June, good luck!!!! Living life, or in this case training, day by day is also a great way to go. I find that goals help to keep me better focused, but I also know that they don’t work the same way for everybody. I like revisiting goals too! I do like the approach you/others take and break create monthly goals as well. I am impressed you got 50 miles + in with the busy month you had. Summer is going to fly! Best of luck with the remainder of school.